Since that article was written, there has been a ground-swell of journal publishers announcing that the online version of the journal is, indeed, the “journal of record.” BMJ, Genetics, Pediatrics, AJR, and Journal of Neuroscience have announced this transition. One explanation for this change is that electronic journals offer advantages to the readers like instantaneous delivery of each issue (including internationally), RSS feeds, and space and storage savings. But the main reason that online journals become the official record is due to the enhancements offered in the digital environment. Hypertext links, movies, sound, images, and supplementary tables or data are all now commonplace features. Also, teaching points in the form of “key concepts” are frequently utilized and bulleted or color-enhanced for ease of use by instructors and students alike. The popularity of mobile devices and e-readers may contribute to the growth of electronic titles being favored over print. try to identify when the online version of a journal has more content than the print version. search for retractions, errata, and comments in a way that can be cited. The UVM College of Medicine is a member of the Consortium of Academic Health Centers for Integrative Health, joining 50 other academic centers to further understanding and knowledge in integrative health.The exhibit defines integrative health and the overall goal of academic health centers to foster an exchange of constructive ideas, bridging Complementary and Alternative Medicine (CAM) and Conventional Medicine. The UVM College of Medicine collaborates with the Laura Mann Center to help educate all interested health care providers and medical students about the integration of alternative and allopathic medicine. Also highlighted in the exhibit is the National Center for Complementary and Alternative Medicine, the federal government’s lead agency for scientific research on CAM. 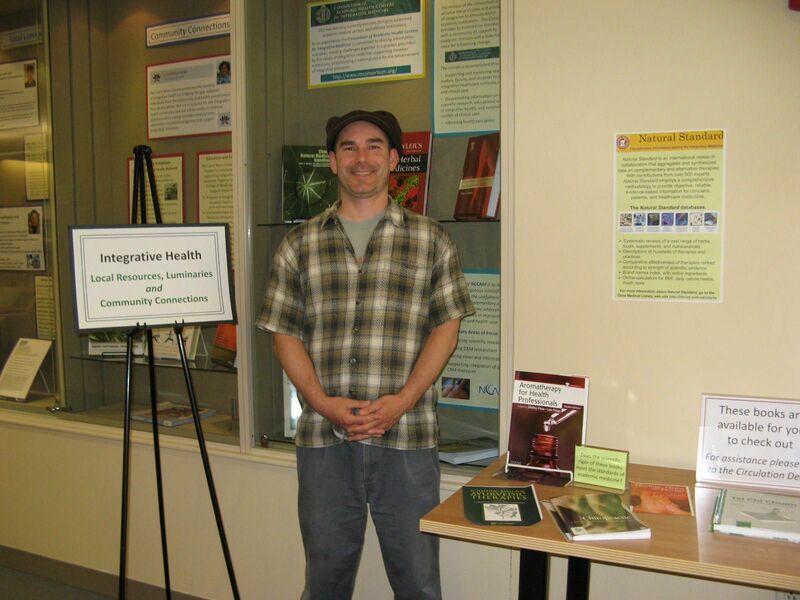 Visit the Library to view the exhibit and Dana’s resources on complementary and alternative medicine. Skin rashes are particularly hard to distinguish and can be a major clue in the diagnosis of a disease. VisualDx is a visual diagnostic decision support system that links health care professionals to medical images and information prepared by physician scholars. This online program includes over 50,000 images and current medical evidence. VisualDx allows the user to determine how they want to use the system – to develop a patient-centric differential diagnosis or to search for a specific diagnosis. Watch this movie for a 4-minute demonstration. VisualDx can also be used on your mobile device. See our mobile guide for more information. It seems like everyone has some kind of mobile device these days, and iPads are one of the most popular. iPads are particularly flexible and let you access all kinds of health sciences content from an electronic textbook to a mobile app of a clinical point of care tool. Wouldn’t it be great if you could take one for a test-drive before making a decision to purchase? Or try one out on clerkship to see how it fits into your work flow? Dana Medical Library is excited to make two first-generation iPads available to UVM students for check out. The iPads come loaded with various medical apps, many from library-licensed content such as DynaMed and Natural Standard, e-books and textbooks, productivity apps and clinical calculators. An iPad can be borrowed with a valid UVM student ID for one week, and renewed for additional time. Patrons will be able to download their own content using their personal iTunes accounts. When an iPad is returned, all data and settings will be wiped from the device. Any apps purchased should remain available through the iTunes account once the device has been returned. For more information about borrowing an iPad, see our iPad Lending Policy. Browsing the journal literature is a great way to keep up to date in your profession, but did you know it’s possible to receive low-cost continuing education credit from journals available through Dana Medical Library? In addition to being a resource for higher education, research and clinical care information, databases and journals may be used to earn continuing education credit. You can even choose the topic for which you wish to earn credit. Identify journal articles that include CNE in a topic of your choice. To do this, first search for a topic – endoscopy nursing, for example – then simply limit the search to CEU as the publication type – at this writing, fifteen articles featuring CNE credit were found, on just endoscopy nursing. Choose one of the articles that interests you, read the article, complete the evaluation form, and follow the instructions at the end to submit for credit, and you’re done. Some journals offer free CEUs and frequently, if you have a personal subscription to the journal, the fee is waived. Sometimes, however, there is a fee for submission. Use CINAHL Education modules. Register at no charge at ceu.cinahl.com to select from a number of different topics, representing a broad selection of practice areas. Review the course materials online, practice with an interactive review program and when you wish, take the online test to demonstrate your knowledge. Certificates may be printed from this web site and a designated person, such as your nurse educator, will receive an email upon your successful completion of the module. Contact Dana Library Reference for searching tips in CINAHL or other questions about using Dana Library’s resources in earning continuing education credit. 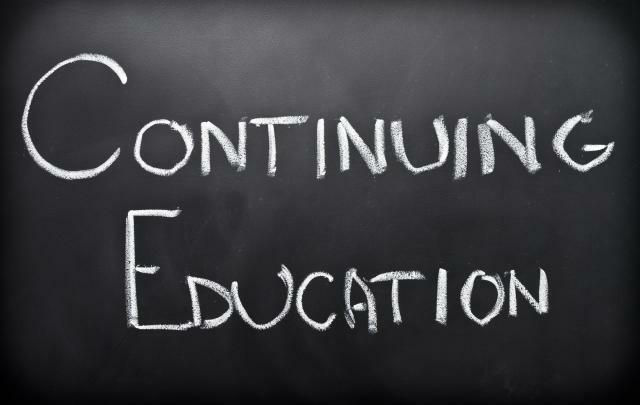 Next issue: Using Dana Library resources for Continuing Medical Education (CME) credits. A new link on Dana’s home page will hopefully improve health care providers’ access to medical evidence that can answer the most pressing patient care questions. The simple page consists of 5 individual search boxes for the most popular and highest quality point-of-care clinical tools: DynaMed, UpToDate, Cochrane Library, PubMed and CINAHL. This page has also been integrated into PRISM, Fletcher Allen Health Care’s Electronic Health Record (EHR), and is called Dana Search under Reference Links. Librarians hope that when a physician or nurse has a patient record in PRISM open, and has a question regarding that patient’s care, fast and easy access to these search boxes will bring them to the medical evidence that answers their questions even quicker than before, ultimately improving patient care. Outreach and professional development work is very important for librarians and library staff. Not only does it provide an opportunity to communicate Dana Medical Library’s full range of services to potential patrons, it helps the Library better understand the diverse needs and interests of our clients. Leaving the library to present at or attend an event ultimately helps fine tune current collections, services and programs and develop new ones for the future. Here are a few of the events attended this past quarter. Dana Librarian Alice Stokes presented a class on mobile library resources during the EDU@UVM Staff Development series over Spring Break. The class, Library Databases, Journals and Books on your Mobile Device, attracted staff from seven University departments and offices. Participants learned about library apps for smartphones and tablets, e-books, and the Libraries mobile websites. 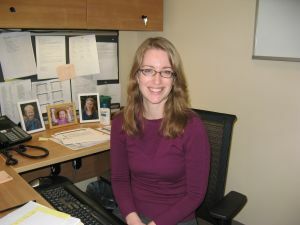 More information about mobile apps from Dana can be found on the Library website: http://danaguides.uvm.edu/mobile. A recent conference sponsored by the National Library of Medicine (NLM), New England Region examined issues of health information equity. The conference was attended by medical and public librarians, public health workers, AHEC representatives and Regional Medical Library staff. Dana Library Director, Marianne Burke, who has conducted health information outreach projects and has had NLM-sponsored contracts was in attendance. Vermont’s own Jessamyn West, a librarian who consults with rural public libraries on technology and information access spoke on the continued Digital Divide. She provided data from recent Pew studies showing that digital access disparity parallels health disparity in populations by race, socio-economic class, and region. A lack of computing and network resources can translate into health literacy disparities in communities. Since so much health information is communicated at the family and community level, the lack of technology access may make the dispersion of information throughout communities slower. Public libraries have been a great leveler providing high speed internet access across rural and disadvantaged urban regions; they are also good sources of health information. Studies have shown that library–based Internet need exceeds capacity, and that many inquiries at libraries are health-related. Vermont Organization of Nurse Leaders (VONL) held their annual conference April 19 and 20. Fred Pond, MLS and Bob Sekerak, MLS staffed an exhibit and met with close to 150 nurse leaders from across the state. Dana resources and services were highlighted. Fred Pond, MLS Dana Librarian, presented at the first spring 2012 presentation at UVM’s Center on Research on Vermont on the work he has done to preserve old films. Pond was working with the film collection at the Vermont Historical Society in Barre when he uncovered a film cannister marked, “Montpelier- Silent.” Inside was a 16mm color film of about 45 minutes in length. When Pond looked more closely, he discovered the film was more than a film featuring Montpelier. The film turned out to be a silent documentary showing the Vermont State Guard during World War II. Vermont State Guard in World War II is among the films which the Vermont Historical Society recently embarked on a project to move from film to DVD, digitizing them for use by communities, researchers and film makers. Pond presented the challenges and rewards of this process, along with selected footage from titles from the VHS Leahy Library Collection, featuring a mix of home movies, state development, and commercial films of Vermont’s industries. 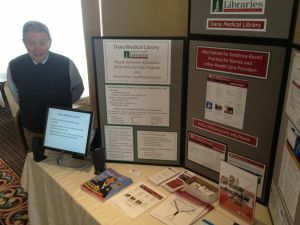 On April 3, 2012 Dana Medical Library joined 90 area businesses at the 13th annual South Burlington High School Career/Job EXPO. The event offers high school students an opportunity to explore new career pathways and talk with professionals and business leaders about college options, employment, shadowing, and internship opportunities. This year Dana librarian Nancy Bianchi used a Harry Potter theme to welcome students to learn about careers in medical librarianship. EXPO attendees who stopped at the Library’s exhibit table were invited to take a five question Harry Potter quiz, and then encouraged to ask the librarian about the magical similarities between the “Wizarding World of Harry Potter” and Medical Librarianship. Potions, Hogwarts Library, and Dementors made the Dana Medical Library’s exhibit a popular stop at this year’s Career/Job EXPO!